(ANDY WARHOL) (THE VELVET UNDERGROND). 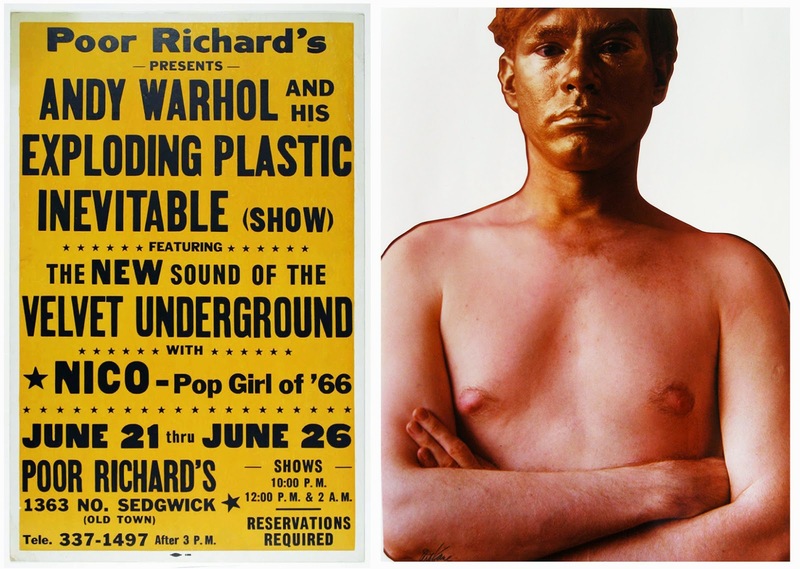 “Poor Richard’s presents Andy Warhol and his Exploding Plastic Inevitable (Show) Featuring The New Sounds of the Velvet Underground with Nico – Pop Girl of ’66, June 21 thru June 26, Poor Richards 1363 No. Sedgwick (Old Town) (Chicago)”. 1966. Letterpress on cardboard. 22 x 14”. This example previously on long term loan to the Andy Warhol Museum in Pittsburgh, PA.
ART KANE. Andy Warhol. 1962. Vintage dye transfer print. Signed. Inscribed. Vintage print. Framed dimensions: 36 ½ x 29 ½”. Alden Projects™ presents Warhol and the Velvet Underground: Intermedia Collaborations 1966-67 at NADA Miami 2014 (Booth 2.28). Along side his early work as painter and filmmaker, Andy Warhol managed--and collaborated profoundly with--the rock band, the Velvet Underground. 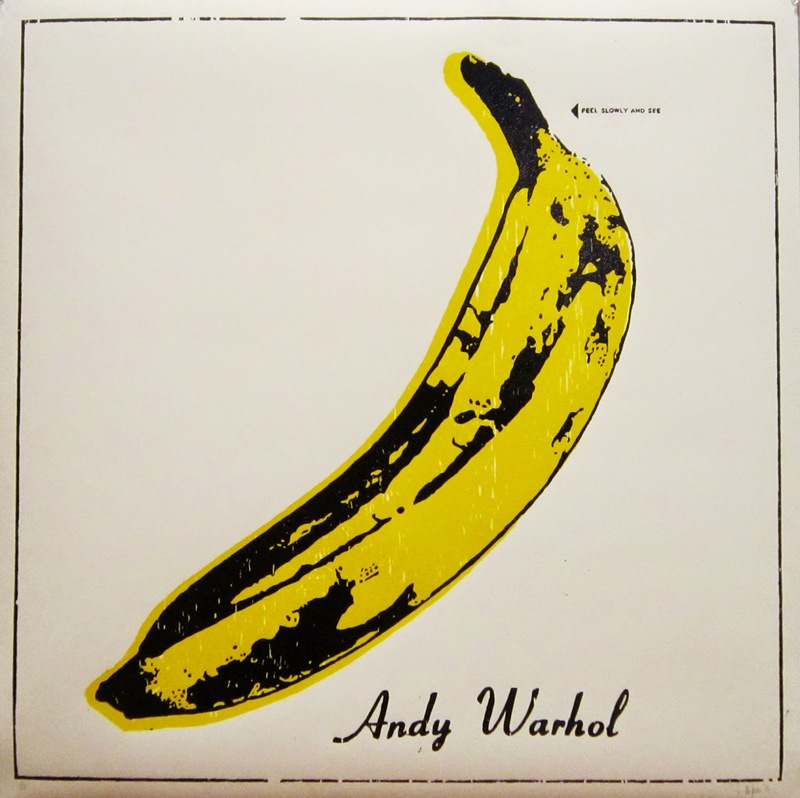 Apart from simply contributing the interactive, peel-able “banana” artwork for the Velvet Underground’s first record (released March, 1967), collaborations consisted of groundbreaking interdisciplinary events and performances of so-called “intermedia,” combining film, music, dance, and lighting into a then-novel mixture. Turning his back on the autonomy of painting, Warhol’s hydra-headed, time-based, collaborative enterprise repudiated the purity of artistic media and individual authorship in favor of creating staged, happening-like events in diverse media. Shows were attended by mostly small numbers at art contexts, including the ICA in Boston and Rhode Island School of Design in 1966 where films and lights were projected onto musical performances of the Velvet Underground, including the choreographed dancing (sometimes with whips) by Warhol’s painting assistant, Gerard Malanga and others. Although the Velvet Underground went on to become just about the most influential band in the history of recent music, their particular place in the collaborative context of Warhol’s fine art deserves more focus. (ANDY WARHOL) (THE VELVET UNDERGROUND) (EDIE SEDGEWICK). 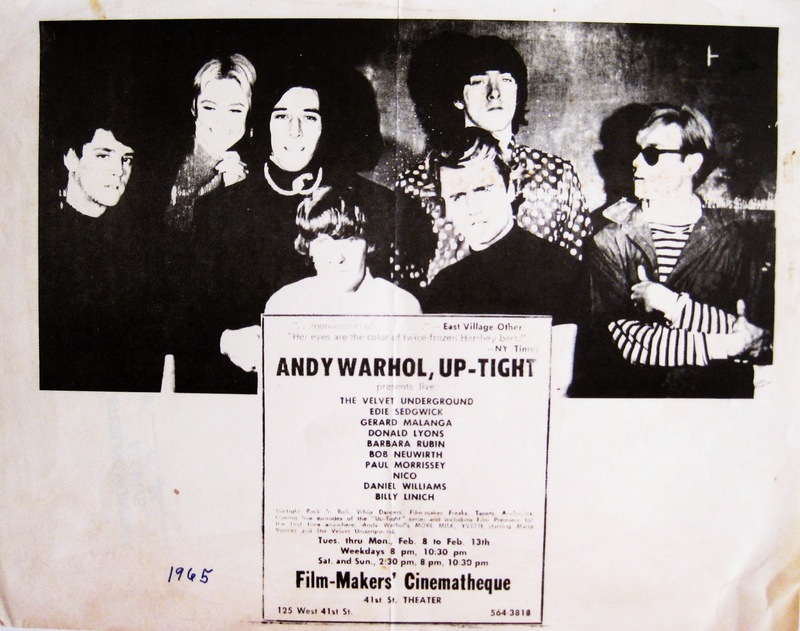 “’Andy Warhol, Up-Tight’ Feb 8 – Feb. 13th (1966), Film-Maker’s Cinematheque, 41st St. Theater.” Offset. 8 ½ x 11”. Flyer. Marked "1965" (sic) by Sterling Morrison. Alden Projects™ brings together rare exhibition posters, event flyers, and unused tickets which, due to the essentially ephemeral character of these time-based events constitute, in some cases, just about the only tangible residue of what remains of these historic collaborations. Alden Projects™ also announces the release of three new hand-carved, woodblock prints in small editions by Brooklyn-based artist, Nils Karsten, bringing a contemporary vantage onto this historical gambit. Also notable: Art Kane’s (1925 – 1995) early, large-scale, photographic portrait of a “golden” Warhol; the two art-directors-turned artists collaborated together on a 1962 magazine advertisement for Champion Papers that same year by creating portraits of each other. NILS KARSTEN. Banana. 2014. Hand-carved woodblock print with ink on paper. 38 ½ x 38 ½” (work dimensions). Published by Alden Projects™ in a signed and numbered edition of 12 unique prints, some with different colors; four artist’s proofs. Finally, Alden Projects™ also exhibits editions, prints, drawings, photographs and ephemera by John Baldessari, Jean-Michel Basquiat, Piero Heliczer, Jenny Holzer, Robert Longo, Lee Lozano, Ed Ruscha and Christopher Wool and others.